The Wireless Videoscope provides cost-effective examination of internal structures without teardown, or for 'machine vision' applications. Maintenance and troubleshooting tasks can be performed with the minimum downtime, while maximizing safety, efficiency and operational time. The SDV-02W-T allows remote visual inspection of inaccessible areas such as wall cavities, roof voids, under seats, ventilation ducts, pipes, tanks, engines, castings, between floorboards and many other hard-to-reach places. Security personnel need to check vehicles, aircraft, ships, trains etc. with the minimum equipment and their search products must be reliable, portable and easy-to-use. Work spaces are often confined and operators therefore, require compact, easy-to-use equipment. 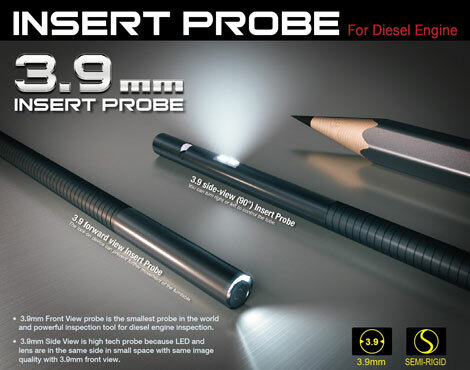 The smallest probe camera in the market. It was special design to access any tiny place.